Walking back down the flight of stairs and closing the door, Mike made his way back down the corridor to the stairs and glanced around before making his way down them. "Daddy where you at?" He called as he walked into the living area of the house looking around for him, "daddy? Hey! Daddy where'd you go man, dude help me out here!" "Mike! Chill boy! I'm in the drawing room!" Raphael replied making notes of needing to re-paint the walls and fit a new carpet, along with new arm chairs, "these need to go, wood has rotted right through to the point of just a touch and down it'll go, ok there's enough room for a couch and two arm chairs, that bookcase needs replacing, but the books look in good use at least," he said, talking to himself as he wrote down changes in his note pad. Mike walked to the drawing room and smiled as he walked up to Raphael, "I just found out something the guy didn't tell you about this house~" he smirked in a sing song tone, "I found the way to the attic and the guy told you that every room in this house was recently unlocked, but the attic is totally locked, I wonder why it's locked huh? Maybe they don't want you to find a dead body that's still in there." Sighing in slight annoyance to Mike's suggestion of having a dead body in the attic, he reached into his back pocket and took out a skeleton key he was given and held it out to Mike, "this is a skeleton key, why don't you go investigate the attic and see if you will supposedly find said dead body you seem intent on finding up there," he smirked at him, "you play your investigation game detective Mike and let me know what you find up there, I need to finish up on my list of replacing inventory in this house if we're going to make it livable here." "Could have just told me you had a key for skeletons, if I find skeletons in there I'll know why you had this and I'll turn you in to the Mike police" Mike replied chuckling as he took the key and returned to the upstairs corridor and made his way back to the dead end door, as he turned the handle, to his surprise and confusion it was locked. "What the? Okay something is really weird going on here, this door was open, how's it locked??" Shrugging slowly, he placed the skeleton key into the keyhole and turned the key slowly, hearing it unlock as he slowly opened the door, expecting something to jump out at him. Nothing, just the stairs leading to the attic door, unless the doors re-locked themselves after closing, how else did the door re-lock itself? "Okay, just walk up the stairs Mike, it's just a old house and old doors, they probably used old locks that are designed to lock themselves or something," he said, giving himself a pep talk while making his way up the stairs cautiously to the attic door. Gently inserting the key, Mike slowly began to turn it, a moment before realizing it wouldn't unlock, deciding to turn it the other way, still it wouldn't unlock. "What's going on? I thought this would unlock it." He sighed and looked over his shoulder, "da-" he began before hearing something clatter beside his foot, glancing down, his eyes widened slightly, it was the key. How? How did that key land beside his foot? Mike slowly picked up the key and placed it back into the keyhole and watched, swallowing slightly. His eyes widened as the key, seemingly by force was pushed out from the keyhole to land beside his foot once again. 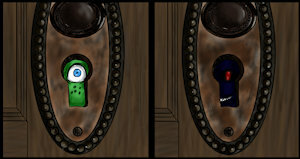 Retrieving the key, he moved his body down to peek through the keyhole, unsure why he wanted to take a peek, every sense in his mind told him to leave that very second, but his curiosity screamed to check what made the key get pushed from that keyhole. As Mike took a peek through the said keyhole, he could see somewhat of the attic momentarily before another eye suddenly came into view, staring at him in a menacingly evil way, black as the night along with a red pupil in the shape of a slightly thick curved line, similar to a cat's pupil. "DADDY!!!" Mike screamed as he ran down the attic stairs and back to the corridor, "daddy!! There's something in the attic!! I saw a eye!!" He called panicked running up to Raphael, "there's something in the attic, I couldn't get in but the key got pushed out! I saw it! I I took a look through the keyhole and then this eye came out of nowhere, it was black with a red centre!" Mike explained hastily, bouncing on his heels in a panic as he held onto Raphael's arms. Raphael quickly rushed out from the drawing room, meeting Mike at the stairs to his panicked state and firmly yet gently held onto Mike's arms giving him a slight shake along with a slight tap to his cheek to send him back into reality, "calm down, you must have seen a passing bat or a trapped bird or something, nothing has that type of eye you described. You know what has caused this don't you? All those horror movies you watch, you're becoming paranoid of things, I'm parental blocking the horror channel once we get a tv," he replied taking the key from Mike's hand and made his way up the stairs, "black eyes with red centres in the attic," he muttered getting to the corridor and glanced at the dead end door seeing it wide open, revealing the attic stairs. Sighing deeply as he made his way over to them and began his way up to the attic and placing the key inside he began trying to open the door, "hmm must be a rusted lock, no use in trying to force the key to open it, it'll come in handy for other locks I'll be putting on these old doors," he said taking the key out, as he let out a sigh, "an eye in the keyhole, another excuse to make me open something he couldn't," Raphael mumbled shaking his head as he made his way back down the attic stairs to the upstairs corridor and made his way back to the ground floor handing Mike back the key, "it's just rusted locked, I'll have someone jar it open later, there's no need to make up stories to have me try open things for you Mike, I have work to do on getting things sorted." Mike blinked at him in disbelief, "but but..." he began and thought better to not argue, Raphael didn't look to be in the mood for arguments or being reasoned with, sighing in a lost battle of communication, he glanced up the staircase, he knew what he saw, something was in that attic, what, he didn't know and he wasn't in a hurry to find out either.